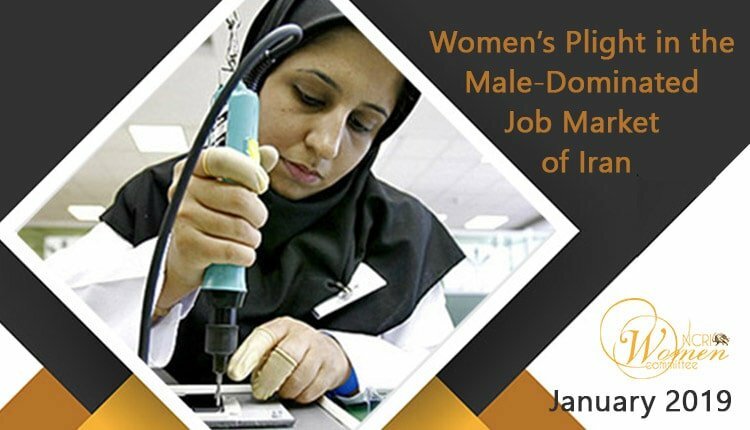 The official Iranian news agency IRNA published a report on January 17, 2019, indicating that Iran’s job market was male-dominated. The NCRI Women’s Committee Monthly Report – January 2019 has focused on gender gap in Iran and discrimination against Iranian women. Based on the statistics published by the United Nations Development Program (UNDP), IRNA reported that women’s participation rate in Iran’s job market in 2017 was only 16.8% which is very low compared to the male participation rate which was 71.4% in the same year. The above estimate seems to be an exaggeration since the National Statistical Center (NSC) estimated women’s economic participation at 14.3% in 2016 and 13.3% in 2015. In 2016, the NSC announced that there was a 1.6 per cent drop in women’s economic participation compared to the previous year which was 13.3 per cent. Then it set the rate for 2016 at 14.3% instead of 11.7%. Given the bankrupt state of the Iranian economy and the swelling army of the unemployed, the reports on women’s economic participation seem to offer a tampering with numbers rather than a reflection of the reality, and the actual figures must be assumed to be much lower than those officially announced. In its annual survey of Iran’s labor force, the National Statistical Center (NSC) also confirmed gender inequality in the job market of Iran in the 10-year period spanning from 2008 to 2017. The NSC findings indicate that the Iranian population aging 10 years and older is divided 50-50 between the two sexes but the 63% average participation rate of men in the job market was four times greater than women’s participation rate of only 14% in the said period. Read the NCRI Women’s Committee Monthly Report – January 2019.